As a family medicine doctor, I spent 4 years in medical school, then what seemed like an even longer 3 years in residency. As physicians know, this is 1 of the shortest routes to independent practice a doctor can take. Many spent even more time than I did to earn the privilege of independent practice. I’m sure that most physicians remember the average 80 hours a week in residency often became more like 100 to 120 hours—and then we went home and studied for multiple boards in our “spare” time. We paid the price because we understood, and hopefully continue to understand, that the sacrifice was necessary to master the practice of medicine and properly care for patients. The sacrifice was crucial in everything from diagnosing and treating cancer to performing brain surgery, or even just knowing when a cough is not simply a cough. We realize that by shortchanging our education we could cost someone their life, so we accepted the high cost of admission which required us to sacrifice our own personal lives to save someone else’s. Conversely, many nurse practitioner (NP) degrees have now moved online. In a mere 18 months, with near 100% acceptance rates and 100% online classes, and a minimum of 500 hours of shadowing, a nurse can become a certified NP. I’m sure that not a single physician in their right mind would allow an intern to practice medicine alone. Yet somehow, an NP, with less than a second-year medical student’s education, has earned more credence? I am at a loss to understand how our community blindly accepts this lack of training and considers it sufficient for medical practice when we obviously know better. So why is it that we are so willing to let just about everyone outside of the medical profession borrow that sacrifice for their own benefit? 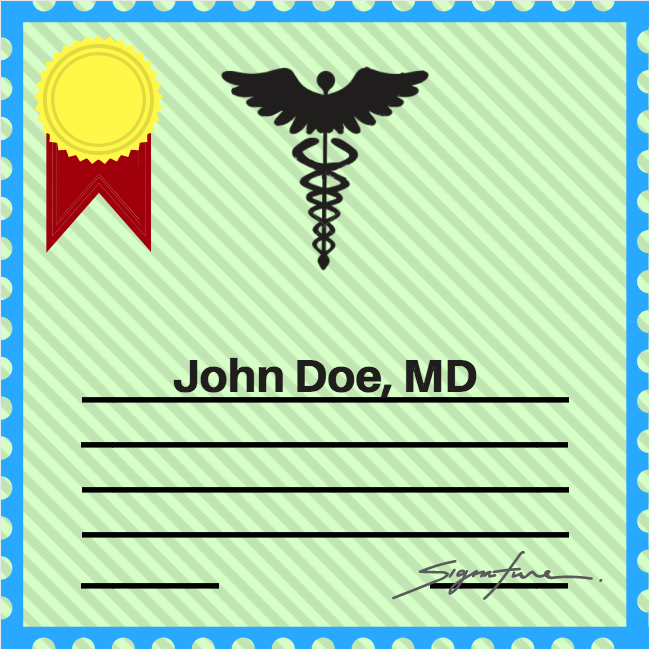 Why are we willing to sign off on people practicing medicine with a mere fraction of our training? Why are we willing to let hospitals open practices and use our licenses for their cost savings while we get all the risk? For those who were not in on the secret, we doctors get all the risk in “collaborative agreements.” Even if the physician is not directly supervising or laying hands on a patient, as long as they are “collaborating,” they legally liable. Ignorance of a case will not protect the doctor. The most recent issue of Family Practice News (published April 2018) points to the case of Quirk v. Zuckerman, a case where an emergency department doctor lost a lawsuit despite never having seen or known about the patient. This is just 1 more example of doctors taking all the risk for very little of the benefit. Furthermore, why would a physician allow someone who has not sacrificed like they have and missed all those birthday parties, weddings, holidays and funerals to get all of the benefits of their blood, sweat, and tears? While physicians were in a hospital ward working during their child’s birth, mid-level practitioners were drinking a latte on their day off from their 9 AM–5 PM clinical rotations. I would like to point out that even if physicians think they are justified in the lending of their license because they are doing so to a competent provider, in a very large way they are endorsing all the others that are not competent. How can I make such a bold assertion? Because every time they sign off on a mid-level provider, they are telling their employer, the hospital, and inevitably the world, that someone with essentially none of their training and sacrifice can do their job just as well as they can. With each mid-level a doctor signs off on, they are sending a message that our sacrifice to our medical training was meaningless. The attestation at the bottom of the patient note signals to everyone that the NP’s 1 year of online study and 500 clinical hours passes medical muster. Do not believe me that that signal has been sent and received by the rest of the world? In 22 states, NPs have won the right to practice independently. All those years of “collaborating” sent the message loud and clear to everyone—employers, patients, the public, and their representative politicians—that their training is just as good as a physician’s. Some may think that this does not apply to them because NPs are “only invading primary care.” Think again. Many are opening skin spas or psychiatric practices—just to name a few areas of insurgency. Meanwhile, if a doctor wanted to become a dermatologist (assuming they are not already), they would have to apply to a dermatology residency, get accepted (good luck) and then go through 4 years of hell before passing more boards to become fully board certified and licensed as a dermatologist. But I’m sure the nurse with 1 year of online classes and 500 clinical hours of shadowing, who was a pediatric NP last week, is just as capable, right? Others might think that “my NP would never go independent.” Once they have gained legal independence, what is stopping them from opening up a competitive practice down the street? While they tell physicians what they want to hear about how smart and omnipotent he or she is, their dues go to fund organizations like the American Association of Nurse Practitioners that fights tooth and nail for their independence from physicians. The warm pot of water physicians are sitting in right now may feel like a jacuzzi because mid-level providers take a lot of the burden off their plates, and probably make them some extra money. But when that pot starts to boil over with independent practice and they stop answering to the physician, he or she will be in that boiling pot alone, as the rest of the doctors will have already died off long ago. Our colleagues are already losing their jobs to mid-level providers and the problem is only getting worse. If physicians are going to take a stand, then we need to do it now. Some might say that I am crazy or call me a conspiracy theorist. Some may think that my Chicken Little posturing will never happen to them, or their supposedly impermeable medical specialty. Rest assured, if it has not actually already happened to you, it has already happened somewhere to your colleagues. In Ellenville, New York, they replaced all the physicians in the emergency department with mid-level providers. In Virginia, there are intensive care units basically run by mid-levels with not a physician in sight. In the South, NPs are doing colonoscopies alone. In England, an NP is performing routine surgeries alone. In 22 states, NPs do not need the physician to practice medicine because they have gained the ability to practice medicine independently, granted to them by the board of nursing, an entity that physicians are powerless over. Let that sink in—that is approximately half of the country that believes physician training is unnecessary and has voted accordingly. It cannot get any worse, right? Be assured, this is just the tip of the iceberg. It is simple logic. Now that NPs are able to practice alone, physician assistants (PAs) and other mid-level professions need to lobby for independence as well, just to stay relevant and be marketable. Why would a hospital hire a PA that needs a collaborating physician when they can just hire an independent NP? The hurricane of independent practice is just starting. Some may think that our system will fix itself because of the absurdity and that it will collapse on itself. But, consider that more money is made off of the unskilled practice of medicine than the physician’s judicial and prudent version. With each unnecessary test ordered, and each misdiagnosis that causes a return visit, money is made for the system that the physician would not have generated when practicing medicine properly. Couple that windfall profit with lower salaries for mid-levels, and it becomes apparent why mid-levels are much more financially sound than physicians. How long do physicians think they have left when mid-levels do not need them to sign charts anymore and they become the more “cost effective” or “value-added” replacement for the costly doctor? What reason does the hospital have than to keep the physician around? With each invasion comes a loss of what we as physicians stand for, what we sacrificed just to understand the complexities of medicine and practice the best medicine that we can. I plead with each and every physician to think long and hard the next time they let someone else use the privilege of their blood, sweat, and tears. Your medical license was hard-earned. Please, protect it from degradation and devaluation. If you do not, all of our futures and the future of medicine as we know it is in jeopardy. Make no mistake, this is not a turf war as much as it is a war over how medicine will be practiced in the future: either by competent doctors, or poorly trained, “cost-effective” substitutes. If all of the above is not convincing, then please remember 1 last thing: the Hippocratic Oath, to do no harm. Patients are relying on the physician to protect them from this disaster because they do not know the difference. And if that message does not get through, just imagine that you may find yourself the dying patient lying helplessly on a gurney in an emergency room staffed entirely by newly-minted online NPs. I am sure it will be just fine as they try to Google what they did not learn from their online studies in an attempt to save your life. Raymond Stanz, MD, is a pseudonym for the family medicine physician that authored this piece. This piece was submitted to MD Magazine for publication and thus does not reflect the views of anyone other than the author.